Attorneys - Buell & Elligett P.A. Skilled advocacy. A team approach. Buell & Elligett has been recognized by U.S. News & World Report with Best Law Firm rankings for Appellate Practice, Eminent Domain and Condemnation Law, Personal Injury Litigation, and Commercial Litigation. An induction into Super Lawyers is limited to attorneys who are ranked among the top five percent of lawyers within a state or region. To achieve this honor, an attorney must be nominated and undergo an intensive evaluation of 12 factors relating to peer recognition and professional achievement. 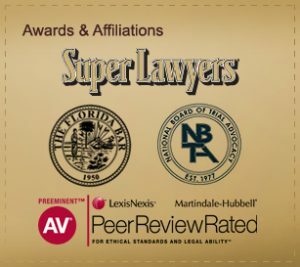 Mark Buell, Tom Elligett and Amy Farrior have been recognized as Super Lawyers. Florida Legal Elite™ recognizes attorneys who have been endorsed by their colleagues as exemplifying an enhanced level of skill or ability. Mark Buell, and Tom Elligett have each earned this prestigious distinction. US News & World Report has recognized Mark Buell as among Tampa's Best Lawyers in the areas of eminent domain and condemnation law and personal injury, Tom Elligett in appellate practice and eminent domain, and Amy Farrior in appellate practice. Best Lawyers evaluates attorneys through a survey of 39,000 leading attorneys who cast almost 3.1 million votes on the legal abilities of lawyers in particular practice areas. A listing in Best Lawyers is "universally regarded as a definitive guide to legal excellence" according to Best Lawyers. Mark Buell, Tom Elligett and Amy Farrior have been recognized as Best Lawyers. Chambers USA is a legal publication that ranks law firms in a range of practice areas. Chambers USA has listed Tom Elligett as a leading Florida appellate lawyer through its publication, America's Leading Lawyers for Business. An AV Rating within the Martindale-Hubbell rating system distinguishes attorneys with high to preeminent legal ability and reflects the attorney's overall level of integrity, experience and professional excellence. Mark Buell, Tom Elligett and Amy Farrior are AV Rated. The Florida Bar distinguishes attorneys who demonstrate an advanced level of knowledge, experience and proficiency with appellate law and procedure, as well as professionalism and ethics in legal practice, through board certification. Attorneys Tom Elligett and Amy Farrior are two of fewer than 200 attorneys to hold this prestigious distinction in Florida. The Florida Bar recognizes attorneys who demonstrate professionalism, competence, trial ability, knowledge, skills and proficiency in business litigation law. Mark Buell is proud to be one of only under 250 attorneys to be Board Certified in Business Litigation Practice by The Florida Bar. The Florida Bar allows lawyers to identify themselves as Experts or Specialists in Civil Trial only after they have undergone a rigorous evaluation of their professional credentials, trial ability, legal knowledge and involvement in civil trial practice. Just over one percent of all attorneys in Florida are Board Certified by The Florida Bar in Civil Trial Practice and Mark Buell is among this distinguished group of lawyers. To be certified in civil trial advocacy by the National Board of Trial Advocacy, an attorney must exceed rigorous certification standards related to civil trial knowledge, professional experience, peer review publication, professional reputation, ethical integrity and continuing legal education. Mark Buell is one of just over 200 attorneys in Florida currently certified in Civil Trial Advocacy by the NBTA. We offer free initial consultations. In addition, we frequently serve as co-counsel to other attorneys in complex litigations, often working on specialized areas of the law and handling appeals. To schedule a free initial consultation or to retain our services, please call (813) 874-2600 or email us at your convenience.